Just a very quick update today – I usually post mini-updates during the weekly roundups and on Twitter, but I know not everyone pays attention to those so here’s something here. 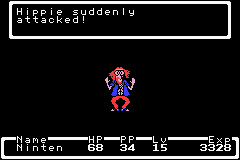 Basically, I spent a bunch of time editing and formatting the MOTHER 1 script and now the main text and enemy descriptions are done. Next, I’ll finish up some battle text and the final battle text and format them and such. And then I’ll go in and play stuff in context and make last-minute text tweaks. While editing/formatting the text, I also compared each line to the EarthBound Zero lines. There’s a whole lot of interesting censorship, mistranslations, and just completely made-up stuff in the EarthBound Zero script. I started to make a list, but there were so many that I think I’ll just post the scripts side-by-side someday so people can browse them, kinda like I did with the MOTHER 3 script. What little I’ve playtested so far definitely feels less Engrishy and less “we gotta chop this sentence in half to make it fit”-ish. And with the optional Easy Ring that I put into the game, the game is also a breeze to play through. I might still look into how to reduce the # of encounters and add that to one of the Easy Ring’s abilities, but I think that also might outweigh the experience boosts if you wind up fighting less. But we’ll see. That’s the only hacking that looks like it’ll be a pain though. Anyway, I updated the project FAQ and crossed a few things off the to-do list. I know you can do it, Tomato! Have you played Super Mario Bros. 7 yet? Awesome job! Are you going to finish the Mother 1 part and then release an incomplete patch with just Mother 1, while working on the Mother 2 part. Or are you going to finish both parts before you release the patch? Anyways, great work Mato! I have to beat EarthBound Zero, then I’m gonna play this! Good Luck Tomato, I am counting on you. Neon Squid: My plan is to release a patch when the M1 side is 100% done, and that patch will also include a basic menu/item/names, etc. translation for the M2 side also. Just wondering, but will the naming menu have a “Don’t Care” button for the patch? It’d be nice if you fixed the text when you pick a character at the hospital was changed since it looked kinda weird in EB0. Don’t post important updates only on Twitter please! I never use that site! You don’t HAVE to use Twitter to follow my Twitter updates. You can simply view this page once in a while, or you can subscribe to the RSS feed here. Hey Tomato, do you think that it’s possible to port the retranslated script over to an EB0 rom? I think that would be better for me because I hear the music’s not fantastic on the GBA port. I doubt it, I don’t think there’d be enough spare room in the ROM. But the Mother 1 music in Mother 1+2 is just fine. Only the music in the Mother 2 part is not as good. Ah ok. There’s no way to expand an NES rom? Not easily and not all the time, depends on each individual ROM. Also, because my translation uses larger text boxes and a few hacks, the EB0 version would have to be hacked up too, and I don’t have the time for that, and it might be harder to pull off some of the hacks with the NES. YOU CAN DO IT MATO!!! I love you so much for this, please have my babies! Can not wait for it. I Can’t Wait for it, it is going to be awesome!!!! i hope that on the next update mother 1 is finished, so that would mean that mother 2/earthbound is the only one left to translate! i hope jeffman can do it good!!! i will be patient for the next update!!!!! MATO, YOU’RE THE BEST!!!!! !, YOU TOO JEFFMAN!!!!! earthbound forever!!!! Keep up the great work! Ya know, my brother doesn’t like Earthbound BECAUSE it is a break from common RPGs. He aslo said I’m the worst gamer ever because I said if I can tell the diffrence between light green and dark green, the graphics are ok. Also, PM me on starmen.net or on patcheresu@gmail.com as Patcheresu, how do you get those Earthbound Central Badges? 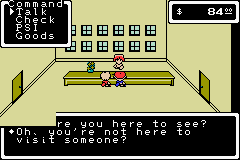 It would be good to translate the game like it was as earthbound. 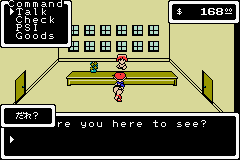 The mother 1+2 version was in my opinion changed in a bad way. If you figure out how to prevent random encounters perhaps make it into a toggled item (if possible) or perhaps another ring to wear. Easy ring is good for pumping up your rewards from winning fights and the Breeze Ring could be used to just walk around without conflict. 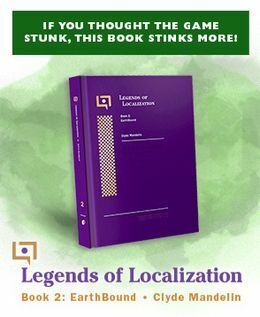 …….Is this translation still being worked on, has it already died and been cancelled or are you busy with your lives? I have an idea for the problem of the expanded text boxes! When you have to select a party member, the text box will contract back to the way it is in M1/EB0, and after you select one (or if you cancel), the text box will expand back out again. Hm…for the Mother 2 translation, couldn’t you use Earthbound as a guide? It’s the hacking, not the translating, that’s the hard part.